On one side of the street, BTD has installed parking meters at the "usual rate" of $1.25/hour. On the other side of the street, the curb is left largely unregulated except for street cleaning. It shouldn't be too hard to figure out which side is which. What you are seeing here is a case of poorly designed parking policy. 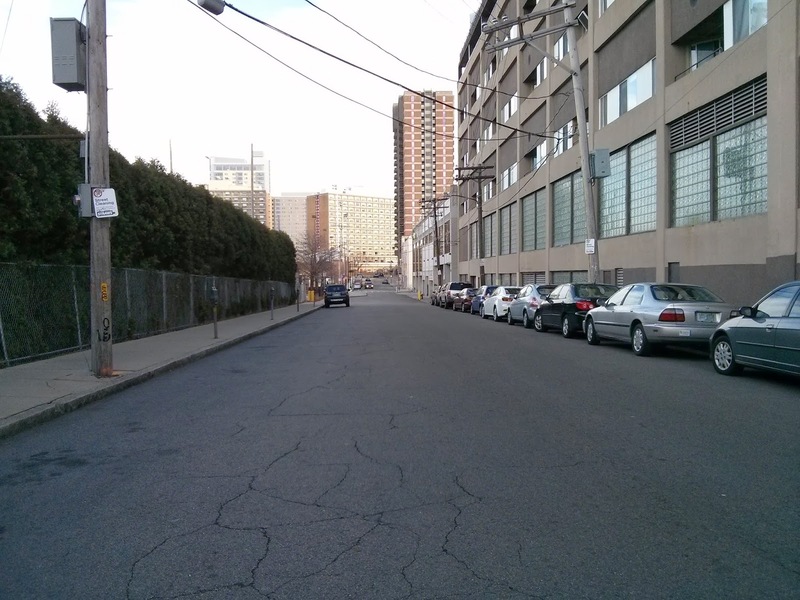 The metered spaces have a price that is too high, and are therefore going wasted. The unmetered spaces have a price that is too low, and are therefore overcrowded. The correct price is somewhere in between, where "correct" means: achieves a reasonable level of utilization that still leaves a few spaces open for new arrivals. Prof. Donald Shoup's rule of thumb is that prices should be set to achieve approximately 85% utilization, which ensures that there will be at least 1-2 parking spaces available on every block, at almost all times. BTD's bad parking policy and refusal to consider reform means that people continue to suffer unnecessary headaches, and they make claims of parking "shortages" even while most of our neighborhood is covered in asphalt. Although I don't own a car, I still find it important to fix. For one thing, it's the right thing to do. For another, bad policy in one area tends to infect other areas. Much of our land use policy, for instance, is dictated by the supposed "shortage" of parking. Even though about half the residents of this neighborhood don't have access to a car, they are forced by zoning rules to subsidize other people's parking. Those regulations came about because the on-street commons is managed improperly, creating an overcrowding problem. And then, instead of solving that problem the correct way, politics dictated bad ideas like "minimum parking quotas" which dump the burden onto the people who are least able to afford it, and also least able to oppose it. This goes beyond just rent, and home prices. Economic development in this neighborhood is artificially depressed because of regressive policies like minimum parking quotas. The suburban-style space requirements of that many automobiles are too much for a compact city neighborhood. The net effect of this heavy-handed government regulation, to force more cars on us, is to squelch normal, healthy, incremental growth. Instead, we get almost nothing, and hardly any changes, for decades. That's a lot of lost jobs, lost opportunity, a heavy price to pay, all because of an irrational fear of parking "shortages" caused by broken policies that do not make sense in urban areas.